I started DADADAH in 1989. I can paint just about anything I want. DADADAH has lasted longer than any of my bands. I suspect it's because the band's so large that personnel changes aren't as devastating as they are in a smaller band. Or it could be that the repertoire is completely "charted" (scored) with areas for improvisation clearly and simply structured. So a new player can adapt to the music fairly quickly. As long as you can both sight-read and improvise virtuosically you can play with DADADAH. Whatever the reason, there seems to be a band persona which has stayed constant through the ebb and flow of individual musicians---proving my theory that bands themselves are living organisms. Another constant has been the level of musicianship. I have been very lucky with DADADAHmy players have always been strong and deserve much recognition. I've assembled some pages which show the various incarnations of the group and identify the individual players so that you, the web-reader, can find out a little about them, link to their sites or email them for their individual performance updates. and it has its advantages. Its disadvantages are the expense of touring, gigging, getting people paid in any competitive way. As a result my tours have been fewer and farther between than they might have been. From fall '97 through spring '99 I decided to take up a monthly residence underneath venerable NYC punk club CBGB's. The theory was if I couldn't DADADAH out to the world then we'd stay put and let people find us. Both records were made with great care and sound great. You can hear mp3 excerpts and learn more if you click on the CD images or go to DADADAH's CD-graphy page. The photo on this page is courtesy of the estate of Lona Foote who died of breast cancer in 1993. 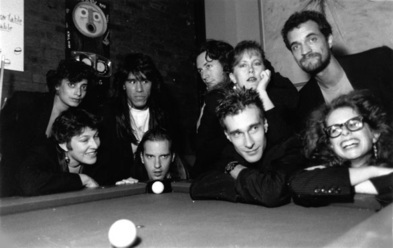 Lona snapped this shot of the band at a College Media Journal showcase gig in summer 1991. From left to right: Elizabeth Panzer (harp), Tracy Turner (french horn), Chris Tso (electric guitar), Ed Broms (electric bass), Danny Weiss (alto sax, flute), Chris Washburne (trombone), Mary Wooten (cello), Chris Nappi (drums) and me.